This tofu shirataki noodles review is for all the readers who told me that I got it wrong when I reviewed Miracle noodles. My Miracle Noodle reviews feature shirataki pasta that contains ZERO calories per serving. 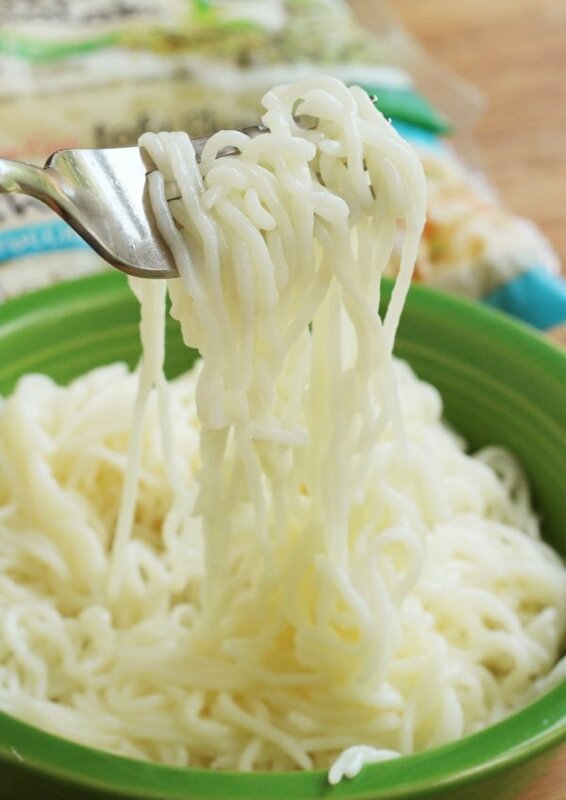 Your average spaghetti could learn a thing or two from shirataki noodles. Alas, I don’t like them at all. Simply put - I found them to be so strange that I couldn’t eat them. When I wrote about them, readers let me know that there was another kind of shirataki pasta made with tofu. I found these at Whole Foods but they are in other grocery stores. They were in the produce section next to the tofu. These noodles are packaged in liquid in bags so they are already “cooked” when you buy them. As you can see, there is whopping 10 calories for 4 ounces so you could eat the entire bag for 20 calories. It is made with soy beans and yam flour – and somehow this results in a form of noodle. These tofu shirataki noodles look more like actual spaghetti than the Miracle noodles. But who cares about looks? How did they taste? With these types of noodles, the first step is to rinse them and boil them for two minutes to “reduce the authentic aroma” (quoting package). The aroma is a fish like smell. I went ahead and did the steps and found myself trying them without any sauce. This is a big risk because they still smelled a wee bit like fish. Are they like actual pasta? No, because they lack the “al dente” bite and flavor of the pasta made with wheat. Are tofu shirataki noodles a great swap for pasta if you are looking to cut calories? YES!!! I think these are pretty amazing for 10-20 calories. They were not slimy like the Miracle noodles and had a firm texture. They don’t taste like anything at all but that doesn’t matter because you can add tomato sauce, fish sauce, pesto whatever! These would be great with my slow cooker lo mein as they have the perfect texture for it (and you add cooked pasta at the end). You can buy three different varieties depending on the dish you are making. 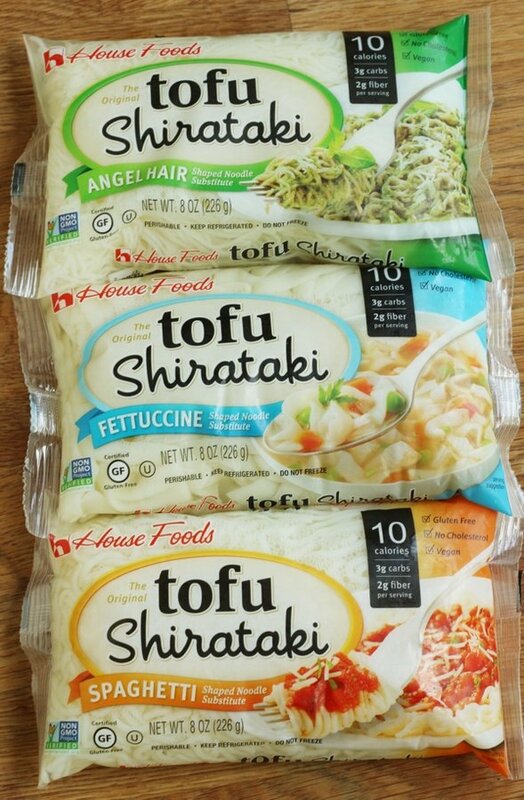 Find House Foods tofu shirataki noodles near you using their product locator. In my area, I could find them at both Stop & Shop and Whole Foods for about $3.49 per package. I wouldn’t use them in a casserole (like a pasta bake) and I would still aim to swamp these for dishes that use rice noodles versus a true pasta dish until I got used to them. Thank you, dear readers, for steering me to a much better option for all those people who love pasta and want to eat less of it. 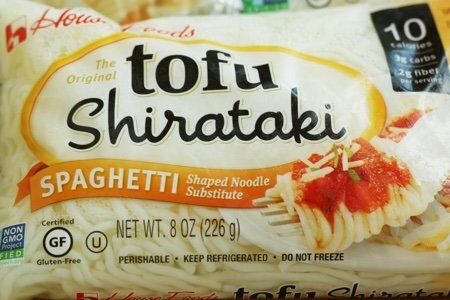 Have you tried tofu shirataki noodles? What did you think? Did you try them WITH sauce? Since that's how people will eat them surely, would love to hear about that. It does sound like a good thing so fingers crossed. Wonder where the fishy smell comes from. I've eaten these with a kind of peanut sauce and really liked them. Haven't tried them with any other kind of sauce, but I imagine that they would be pretty good. Another popular blogger who's title also contains 'girl' wrote about these noodles years ago - and recommends making a version of 'alfredo' with them. You use Laughing Cow light cheese as part of the sauce - it's not bad - but not the first thing that comes to my mind when I'm feeling like pasta. It's okay if you add it to a small serving of spaghetti - it'll make your portion 'bigger' and kinda gets lost in there with the rest of the pasta when mixed up with some sauce and veggies. I tolerate it to save calories. I went to the site to see if I could find this locally, and it looks like they want my name, address and e-mail, just to check. What the hey??? I would not try these due to the chemicals, items I don't find in my kitchen and one does not find in any other noodle I purchase. Brown rice spaghetti - organic brown rice flour and water; whole wheat spaghetti - organic durum whole wheat; red lentil sedanini - organic red lentil flour; buckwheat noodles - organic buckwheat flour; brown rice fusilli - organic brown rice and water. Hi Lisa. Thanks for the new tofu noodles review and I will try them. I could not eat those other ones. Kept trying and they sat in my fridge. Hated the taste. Slimy yukky and could not will my mouth to eat them. I love tofu so these might be good. I am sure our grocer does not carry these. They carried the others but not for long. I live in a very small town but next time I drive 2 hours to a bigger town with bigger grocers, I will look for them. Someone said there are chemicals. What chemicals? Not all chemicals are bad. I would love to try these but I may have to try something else or stick to regular wheat pasta. I've tried tofu shirataki and Miracle Rice both. I agree about the yucky smell before rinsing. AFterward, though, didn't have a problem using in place of pasta with some sauce or other flavoring. I did really like another made from konjac called "Skinny Pasta." First got it from Weight Watchers meeting room. No gross smell. I've seen it in some supermarkets, too. Costs a bit more than shirataki, but may be worth it since it doesn't reek. Tried them as I am eating gluten free & didn’t like them at all.